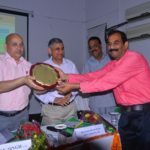 Bihar Animal Sciences University, Patna in collaboration with ICAR-DKMA and Informatics Publishing Limited, Bengaluru organized one day hands on Training for Librarians, Faculty, Students, Research Scholars etc. 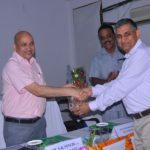 in the Conference Hall of the University on 06th September, 2018.Hon’ble Vice-Chancellor, BASU, Dr. Rameshwar Singh welcomed the chief guest of the programme Sri Sunil Kumar Singh, Chairman Revenue Board, Bihar. 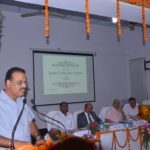 At the onset In-charge CeRA, Sri S. K. Joshi welcomed all the dignitaries and participants. 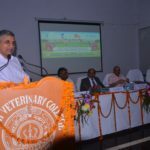 CEO, Informatics, Sri Sanjay Grover in his speech said that nowadays people are addicted to use Google as source of scientific data, he emphasized to use CeRA and related sites for collecting such data. 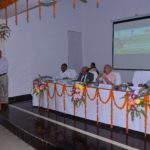 In the presidential address Vice-Chancellor, BASU Dr. Rameshwar Singh deliberated about transformation taken place in the University in the last one year and said University has conducted a series of Workshop, Seminars, Conferences during last one year. He said the cost of subscription to different journals has beeped up and accordingly downloading of Journals is also costlier. 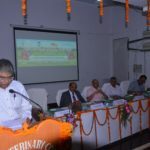 He said, keeping in view of convenience for Students, Research Scholars the ICAR has launched Consortium for e-Resources in Agriculture in his NAIP project in the year 2011. The CeRA portal can be used inside the campus only since its facility is based on IP address provided by the CeRA for different campuses. J-Gate is the gateway for CeRA which has added many more features. 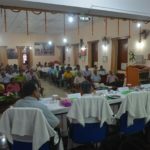 Awareness in eastern region is essential so that maximum number of students, researchers could use the portal for obtaining scientific information. CeRA is providing free of cost access to 1500 e-books and equal number of journals over its portal and it is providing its services to different library of different institutions as per their requirements. He was disappointed with the number of users in eastern part of the country. The charge is beard by the Government for the sake of scientific community. 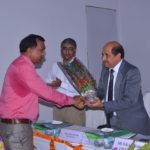 Orissa University of Agriculture Technology was awarded with Best Usage Award of CeRA. Indira Gandhi KrishiVishwaVidyalaya, Raipur was awarded for Maximum number of Profile Registration. 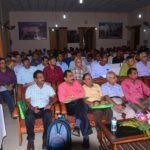 Orissa University of Agriculture Technology was again awarded for highest Documentary Delivery Award. The awards were collected by respective University librarians. 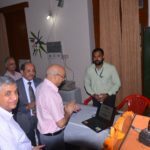 The Hon’ble Vice-Chancellor with Chief Guest Sri Sunil Kumar Singh launched websiteCeRA Regional Ambassador Programme for Eastern Region. Chief Guest, Sri Sunil Kumar Singh appreciated the enthusiasm of students of Chattisgarh for demand for opening college library till late night. He said as such any students or faculty may get books from library maximum number of 3-5 at one time whereas in e-books reader may download books or journals as per their requirements. E-books are utilized maximum in the four states of south India, he added. 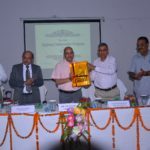 Sri Sunil Kumar Singh was felicitated by Vice-Chancellor BASU with memento as token of respect. 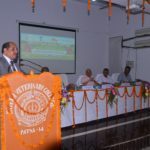 Vote of thanks was given by Registrar, BASU Dr. Pradeep Kumar Kapoor. 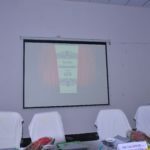 The inaugural session was followed by Technical Sessions. 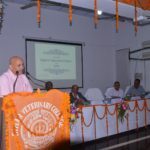 In the technical session Keynote address was delivered by Dr. Veeranjaneyulu, University Librarian, PJTSAU followed by deliberations from Informatics. At the last thank you note was given by ICT Advisor, Dr. Hans Raj. The programme ended with certificated distribution to the participants.